It seems like most of us have tried a cigarette at least once in our lives. Some of us got hooked and some realized that is was a bad decision. Everyone that started smoking on a regular basis has also probably tried to quit. We all realize that it is an unhealthy habit but sometimes quitting is harder then we expect. Each time we try to quit and fail it has a negative impact on our self-confidence. This can lead to feelings of anxiety, stress, hunger and boredom. Although it can be hard to quit, there have been many people who have been successful. Recently, I came across a list that shows how people used creative, unusual, and sometimes crazy ways to kick cigarettes out of their lives. The first unusual method is burying the cigarettes. Not metaphorically, but actually burying it in your backyard. If you fail to resist the purchase of a new pack you should immediately dig up a hole in your back yard and put the cigarettes in. When you start to crave a new cigarette you will need to go to your back yard and dig up the cigarettes. Smoke one and then bury them again. It won’t be long until you finally get tired and bored and realize it’s not worth it. This is a method that works and many people have actually managed to quit by following this. I came across a couple stories where people actually ate their cigarettes instead of smoking them. I am still not quite sure if they used any seasoning on them for better taste, but for some it worked and they never started smoking again. What about hypnosis? A study has shown that people open their minds more to suggestions while being hypnotized. This allows the therapist to subconsciously suggest ideas which make the thought and taste of cigarettes disgusting the next time you think of them. It has worked for some, so if you are brave enough to take this step, maybe it will be helpful. Since I mentioned a method from western medicine, let’s balance it with an equally unconventional eastern method – acupuncture, outer ear acupuncture to be exact. Basically, your ear is penetrated with needles carrying a medical seed which sticks to it. The seed has a relaxing effect on the body and any time you feel stressed during quitting, all you need to do is press your ear for the happy seed’s chemicals to flow in. Keeping track of time is one more method that not many people have thought of. The main problems are the cravings that last 3 minutes on average. 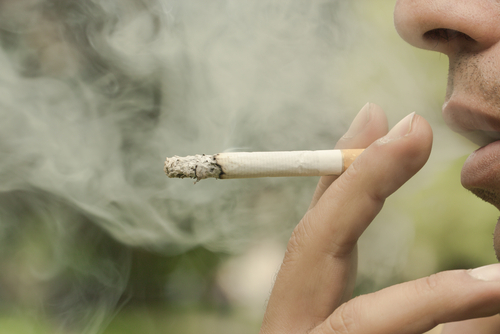 For smokers they seem like hours and the brain isn’t quite working ‘properly’ during it. Turning on a stopwatch during craving session will keep your mind off the urge while refocusing on the passing seconds. Just in case measure the time until the fourth minute. Have faith and remember that you can do it! Be the first to comment on "Unusual Methods of Quitting Cigarettes"